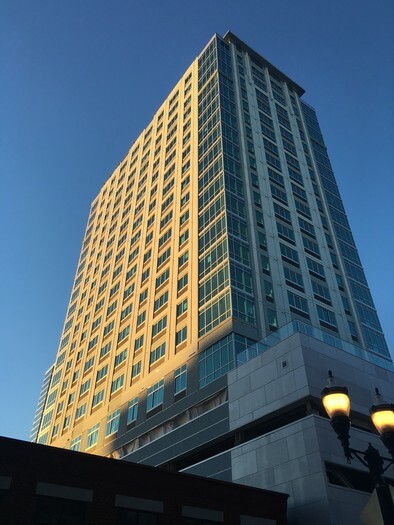 STAMFORD, CT - The F. D. Rich Company is pleased to announce the opening of its latest residential rental building in the heart of downtown Stamford. The 22 story, 226 unit luxurious high-rise, the Summer House Stamford Apartments located at 184 Summer Street was developed by Rich in a partnership with the Manhattan based Andalex Group and HIG Realty Partners. The project enjoys a 97 “Walk Score” because of it close proximity to restaurants, stores, movie theatres, the University of CT, hotels and public transportation. Leasing commenced April 1, 2016 and as of May 1 the building was 1/3 committed. Summer House has become another Stamford landmark and at 22 stories in height it is the tallest residential rental building in the city. Summer House features first-class amenities to compliment the urban lifestyle. It boasts a full length roof top swimming pool overlooking the downtown streetscape, a full sized gym, 24 hour concierge service and security, entertaining kitchen, billiards room, rooftop garden terrace and a pet spa! With express train service to NYC and New Haven being offered at the nearby Stamford Transportation Center a private shuttle will be offered. The building is smoke free.